Heroes of Might and Magic V is a turn-based strategy video game fully rendered in 3D and the game art features classic fantasy creatures in an epic world setting. The story arc is covered in the original Heroes of Might and Magic V game and two expansions, Hammers of Fate and Tribes of the East. A significant sidestory is explored in greater detail in the first-person fantasy role-playing video game Dark Messiah of Might and Magic. 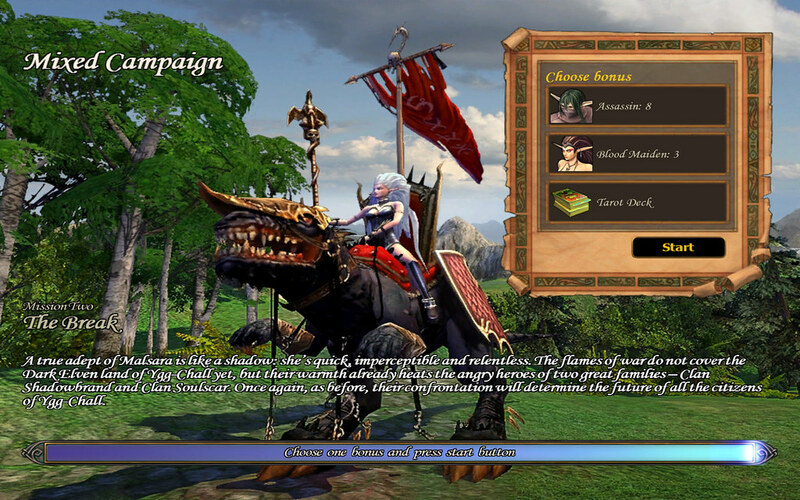 This page has fantasy art, game scenes, cutscenes, and gameplay movies from Heroes of Might and Magic V: Hammers of Fate - campaign 1 "Ylaya's Quest" mission 2. The first movie starts with Ylaya passing a garrison. In this mission, she must escape Soulscar territory by passing three garrisons in two, three, and four weeks respectively, before strong forces block the routes. The second movie appears after the final garrison is passed, then cuts to what happened in Dwarven lands while she was spying on the Soulscar.